Some Girls Just Have To Be The Best At Everything. If any two girls know about being the best, it's Heather Fox and Jasmine King. Just ask them; they'll be happy to tell you. But every girl knows that there can only be one "best." Can Sasha keep the girls from turning the arena into a war zone and still snag a spot on the coveted Youth Equestrian National Team? 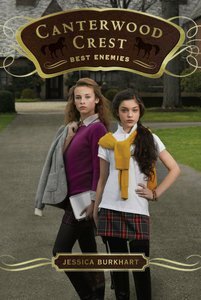 About "Best Enemies (#05 in Canterwood Crest Series)"
Jessica Burkhart was born in Goodlettsville, Tennessee on January 29, 1987. In eighth grade, she had a spinal fusion for severe scoliosis and had to give up horseback riding. She received a BA in English from Florida State University in 2007. During her senior year of college, she signed up for National Novel Writing Month and took on the challenge of writing a 50,000 word novel in 30 days. The challenge resulted in the first draft of Take the Reins. An agent read the manuscript on her blog, she signed with him, and shortly afterwards she had a four-book deal. She is the author of the Canterwood Crest series. She also freelances for magazines such as Girls' Life, Listen and The Writer. Order now to secure your copy when our stock arrives. eBook is Available. 0 Available. Expected to ship in 6 to 7 weeks from Australia.